Easy Showers is a range of shower head and shower bar solutions with a minimalist cylindrical and square design, meeting every need in terms of design and taste. 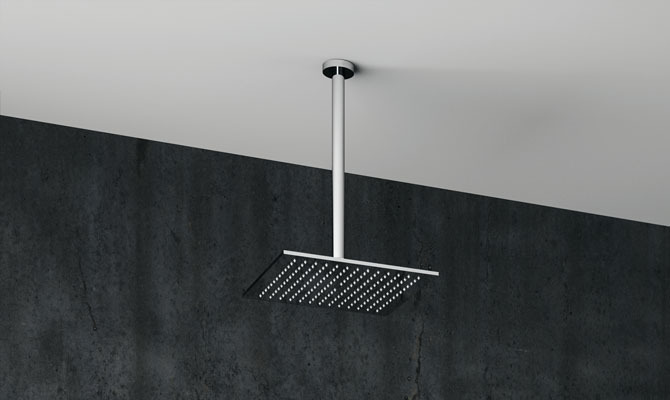 The shower heads are available with a “rain” jet, square-shaped in sizes 200x200 mm and 300x300 mm, and cylindrical-shaped with a diameter of 150 mm, 225 mm or 300 mm; wall or ceiling-mounted arm solutions, including a version with a height adjustable telescopic arm. The shower bars are available with shower heads with a “rain” jet, either square-shaped, in sizes 200x200 mm and 300x300 mm, or cylindrical with a diameter of 225 mm or 300 mm, both of which are available in the thermostatic shower mixer version, which maintains a constant water temperature even in the presence of pressure variations. Built-in wall-mounted shower bars are also available, optimal for refurbishment, with the water outlet at the top, making it ideal for replacing an old shower head without any masonry work. External shower bar with shower head Ø 300 mm, thermostatic shower mixer with diverter, and shower set with multifunctional hand shower. External shower bar with shower head 300x300 mm and shower set with multifunctional hand shower. External shower bar with shower head ø 225 mm and shower set with multifunctional hand shower. 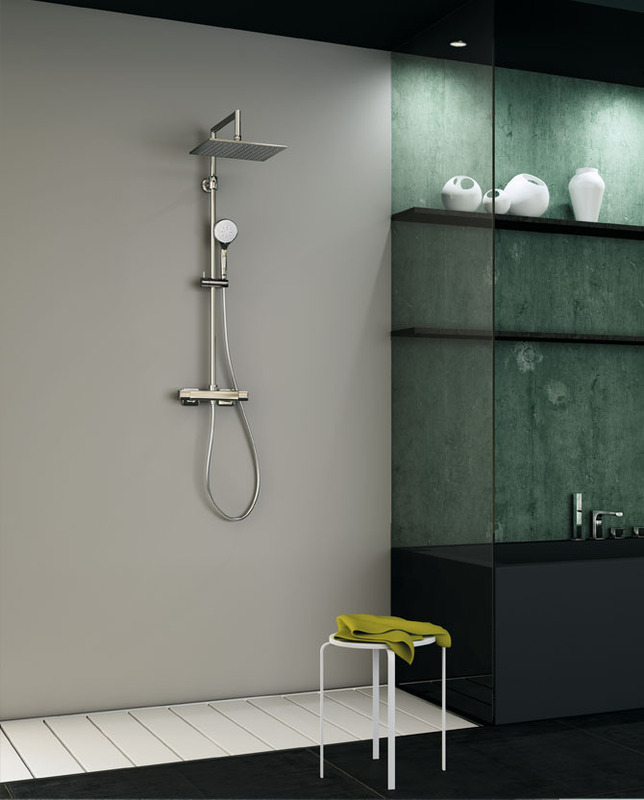 External shower bar with shower head ø 300 mm and shower set with multifunctional hand shower. External shower bar with shower head ø 225 mm, diverter and shower set with multifunctional hand shower. External shower bar with shower head ø 300 mm, diverter and shower set with multifunctional hand shower. Built-in shower bar with shower head 300x300 mm, diverter and shower set with multifunctional hand shower. Built-in shower bar with shower head ø 225 mm, diverter and shower set with multifunctional hand shower. Built-in shower bar with shower head Ø 300 mm, diverter and shower set with multifunctional hand shower. External shower bar with shower head 200x200 mm, diverter and shower set with multifunctional hand shower for wall-mounted bath mixer. External shower bar with shower head 300x300 mm, diverter and shower set with multifunctional hand shower for wall-mounted bath mixer. External shower bar with shower head ø 225 mm, diverter and shower set with multifunctional hand shower for wall-mounted bath mixer. Built-in shower bar with shower head 200x200 mm, diverter, multifunctional hand shower and water inlet in the upper part (suitable for renovation). Built-in shower bar with shower head 300x300 mm, diverter, shower set with multifunctional hand shower and water inlet in the upper part (suitable for renovation).